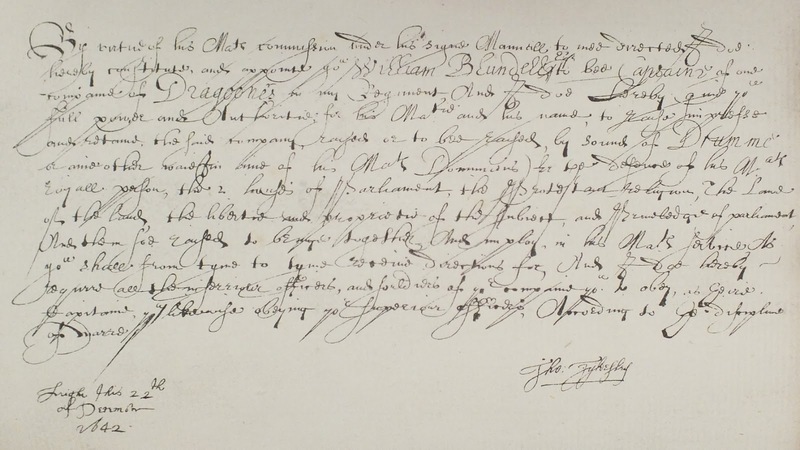 By virtue of his Mats commission under his signe Manuall to mee directed, I doe hereby constitute and appointe you William Blundell Esqre to bee Captaine of one companie of Dragoones in my Regiment. And I doe hereby give you full power and Authoritie for his Matie and his name to raise, impresse and retaine the said companie, raised or to bee raised by sound of Drumme or anie other waie (and in anie of his Mats Dominions) for the defence of his Mats royall person, the 2 houses of parliament, the Protestant religion, the Lawe of the Land, the libertie and propertie of the Subject and Priveledge of Parliament. And when soe raised to bringe together and employ in his Mats service as you shall from tyme to tyme receive directions for. And I doe hereby require all the inferiour officers and souldiers of ye companie you to obey as Capitane, you likewise obeying your superiour officers, According to the discipline of warre. 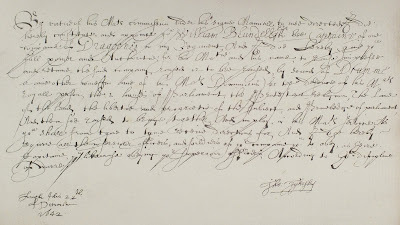 William Blundell was wounded during the assault on Lancaster less than three months later on 18 March 1642/3. A musket shot shattered his thighbone, leaving him lame for the remainder of his life—to his tenants he was known as "Halt-Will".